Shortly after the new Moto X (2nd gen) went on sale for Verizon customers through Moto Maker, readers of ours were quick to point out that the 32GB option was gone within a few minutes. Now that the weekend is over with, it appears as if Motorola is completely sold out of all Verizon variants through their customization site. If you wanted to buy a Moto X for Verizon and customize it through Moto Maker, you can no longer do so. The site only mentions that “Verizon Moto X phones are currently out of stock” and that you can sign-up for updates on future availability. They gave no dates or time estimates. You can still purchase the Moto X directly from Verizon, but Big Red currently only sells the Black plastic or Bamboo variants – there is no customization involved. 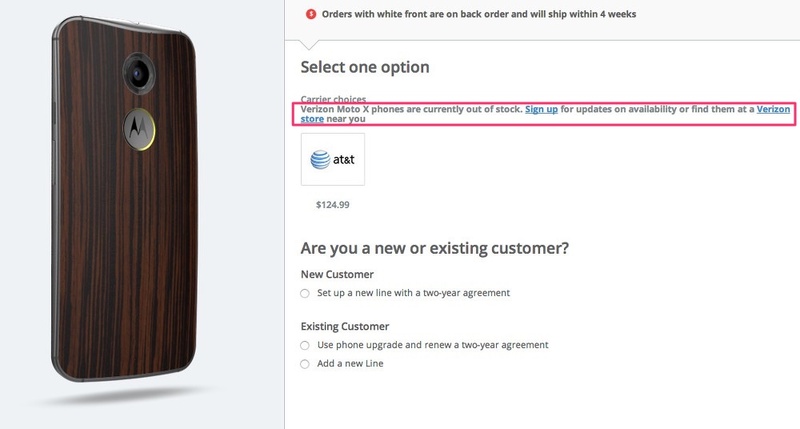 The AT&T model is still in stock with either 16GB or 32GB of storage, even after being made available for pre-order weeks ago. I don’t know that anyone should look at this situation as if Motorola sold millions of phones in a weekend. I think we are probably looking at Motorola only having a conservative amount of inventory available. While I would love to see the Moto X become a success for Motorola in the way that the Moto G and E have, we have a ways to go to get there. Update: Annnnnnd, now Verizon models are all back in stock. Maybe it was just a glitch? It sure didn’t seem like, but hey, order all the custom Verizon Moto Xs you need!